Color Options: Check out all 17 of them here! JetPens was kind enough to offer up a pen for me to review. A few days later, the Sailor Clear Candy arrived at my door. The Clear Candy is an entry-level pen from Sailor, but has some nice touches that are usually found on much more expensive pens. Looking at reviews of the pen on JetPens, there were some who loved it, and some who hated it. The most common complaint was a lack of flow, but the pen that I received writes great and I have no complaints. Onto the review! Well, packaging really isn’t that important to me and in the case of the Sailor Clear Candy, it’s just a crinkly plastic bag. For the price of the pen ($16.50) I didn’t expect any elaborate packaging and I’d rather those costs go into the build quality of the pen rather than a box. The pen doesn’t have too many bells and whistles, but the pen is a good size. The cap has a gold star on the top, and the plastic clip matches the star. 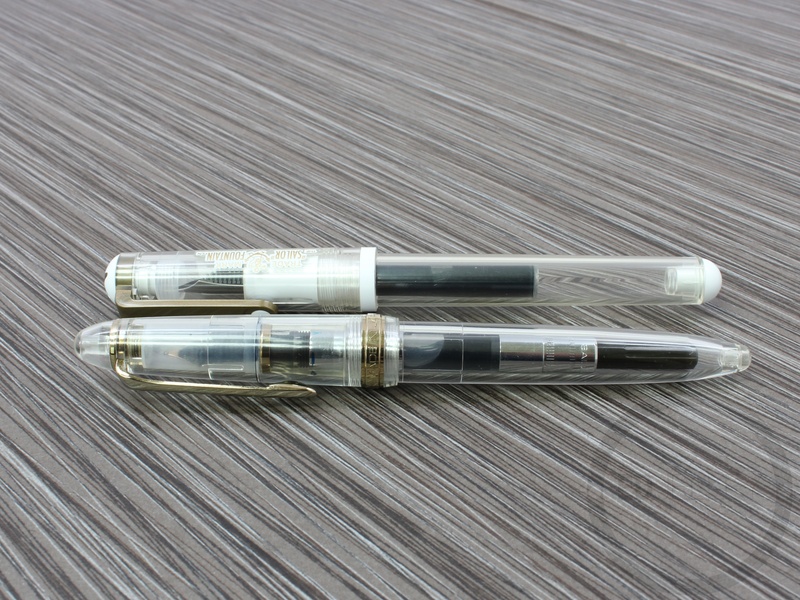 Everything on the pen is either white, clear or gold plastic. The only metal here is the nib, but for a cheap pen at a low price, this isn’t too far out of what is expected. The pen is definitely marketed towards Japanese teenagers, being that most of the colors are bright and metallic. I’m not one to judge anyone really, but the color offerings aren’t quite as masculine as the rest of the pens in my collection. 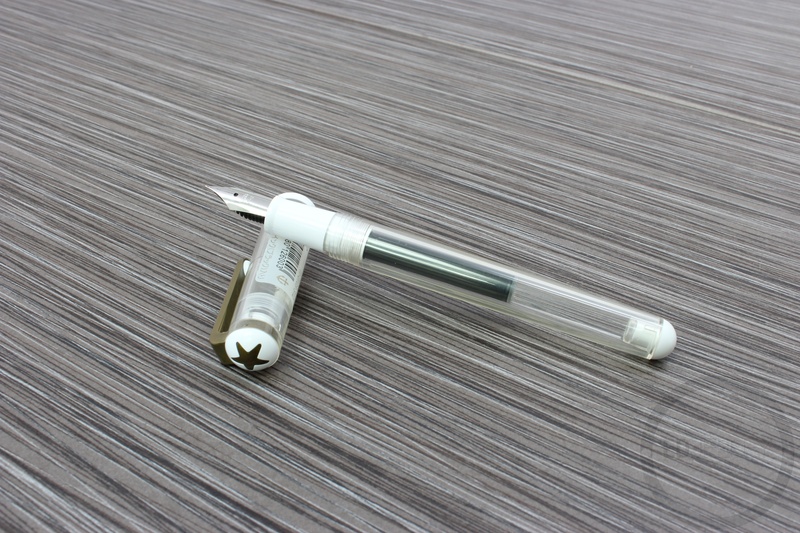 There’s minimal branding on the pen – a small “Sailor” stamp on the nib, a small screened logo on the cap, and a permanent decal (which I thought was a removable sticker) with some Sailor branding and a barcode above the smaller logo on the cap. This is certainly a departure in the looks department from a pen I would normally use, but it’s fun. The filling system is nothing fancy. 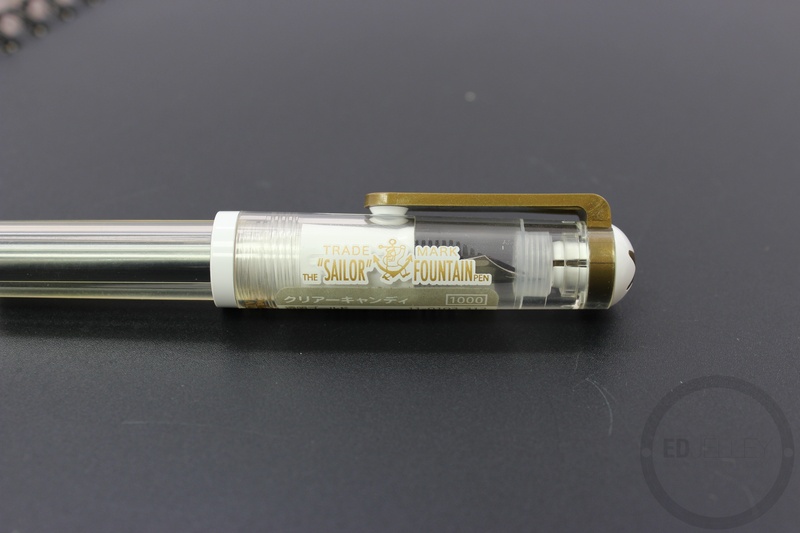 It takes the proprietary Sailor cartridges or Sailor converters. I’ve said it before, I really don’t mind the cartridge/converter system. I don’t really need a pen to carry 3ml of ink, I have way too short of an attention span to go through all of that without wanting to change things up. The best part about the Sailor Clear Candy is the nib. The entire line of pens come with the same M-F nib. 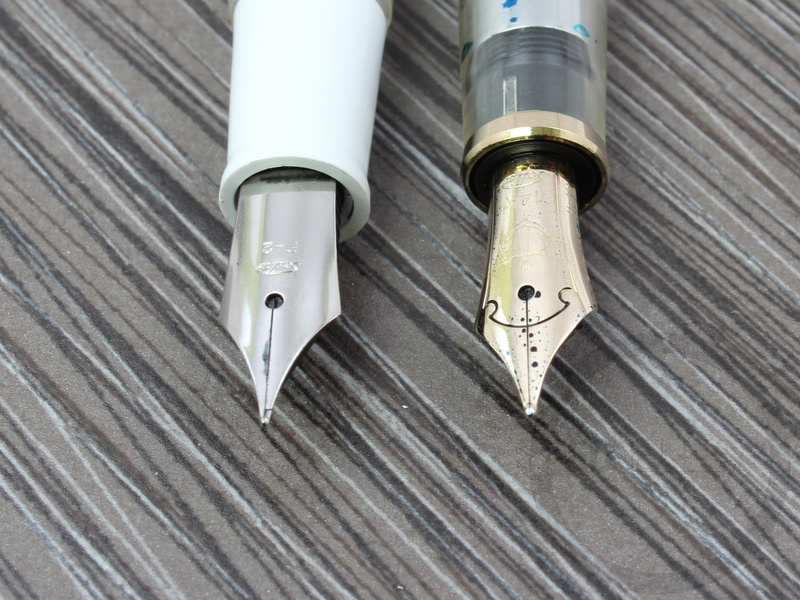 The nib is smooth…very smooth. It’s actually really great. I love the line width and smoothness. It’s definitely one of the better steel nibs I’ve used. I was surprised at how well the pen wrote, given it’s price. The feed is able to keep up with fast writing, and the wetness of the line is right in the middle where I like it. This pen is an absolute pleasure to write with. I’m contemplating doing some pen surgery and seeing what else I can fit this nib on to. The part about the pen that I think most people will have an issue with is the materials that the pen is made out of. The plastic is definitely cheap, and there’s no hiding that. 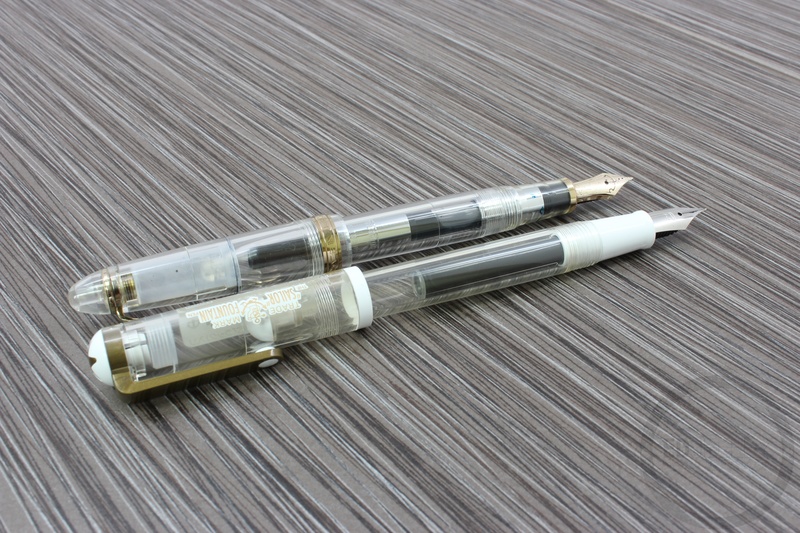 The clear plastic isn’t crystal clear and polished up like a more expensive demonstrator. It feels like the Platinum Preppy (but hopefully less brittle) – like it could crack very easily if placed under pressure (don’t put it in your back pocket and sit down…). The plastic may be cheap, but that doesn’t mean the pen can’t be comfortable in the hand and write well. The light body and the pen’s full-size help cut down on hand fatigue. I really like the wider grip section (as compared to a Lamy Safari or a Pilot Metropolitan). 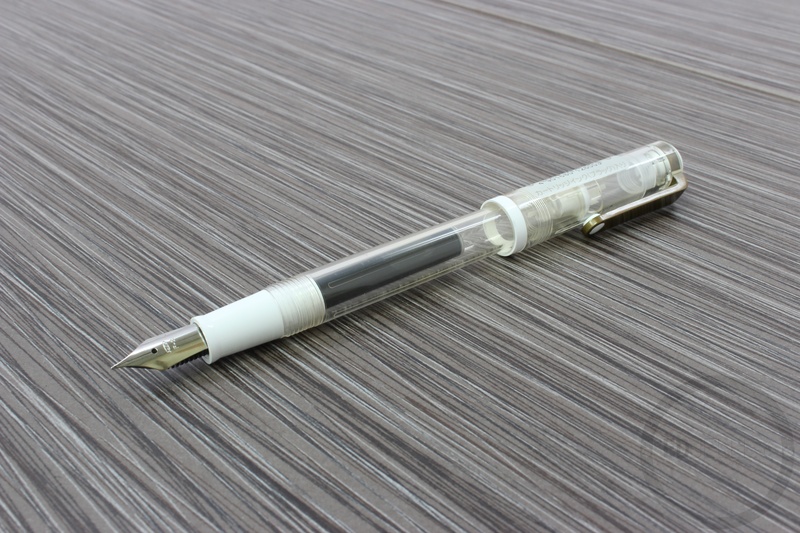 The pen is comfortable to hold and well balanced both posted, and uncapped. The pen is a bit long at around 6″ when posted, but I still prefer to write with it this way. Other than the plastic, I really like how the pen feels in hand. Slightly expensive for what it is. The Sailor Clear Candy has one of the best/cheapest steel nibs I have ever used. It’s better than all of the Lamy nibs I’ve used, and I prefer the line width to that of the Pilot Metropolitan. The body of the pen is made of cheap plastic, but it’s size and weight make for little to no hand fatigue. 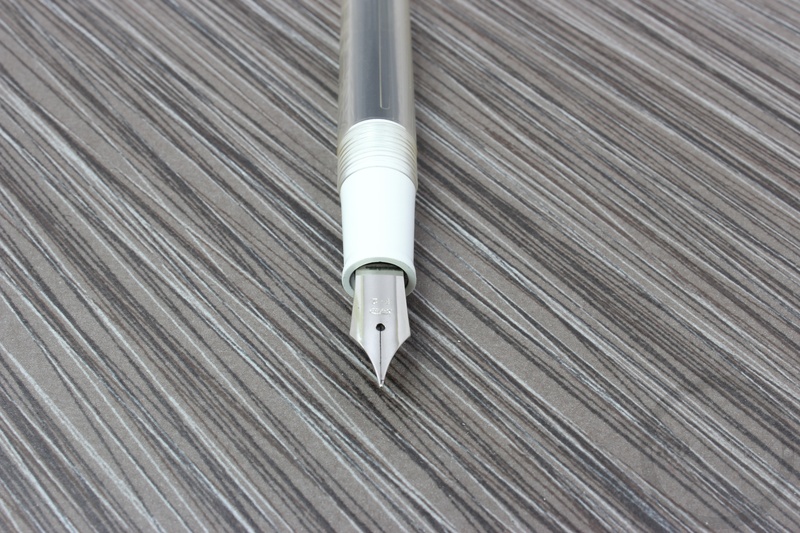 A replacement Lamy nib is around $11.00 and for a few more dollars you can get this entire pen, with the great nib included. I have to mention that the Pilot Metropolitan is a higher quality pen, but it’s not for everyone. Pilot may dominate the sub-$20 fountain pen market, but the Sailor Clear Candy can definitely compete. Even if you don’t like the way the pen looks, I can almost guarantee that you’ll be blown away with how it write. 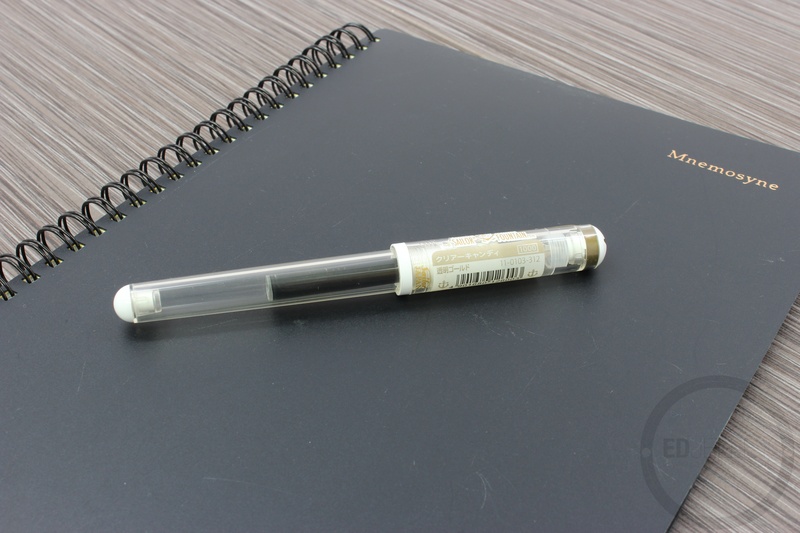 Thanks again to JetPens for sending this over to review, check out all 17 of their color offerings for the Sailor Clear Candy! I got the metallic green – it’s rather cute. Looks great with Diamine soft mint. It runs a bit dry too but it’s not bad for an entry level pen! I actually liked mine quite a bit. I can totally see the Soft Mint working in the metallic green really well. Definitely solid for an entry level pen with a steel nib. I went to the Nanami Paper & Supply Co. site (per your recommendation) to buy Tomoe River paper, and saw that they had these pens available for $10.00 each, though in limited colors. I got the white one with blue anchor logos around the cap. I agree with you that it is a very smooth writer. I was surprised because I also saw it had mixed reviews on JetPens, which put me off it. For $10.00 I decided to take a chance, and so far I like the pen. Nice! The materials definitely aren’t the best, but at $10 I think it’s a bargain. Glad to hear you’re enjoying it!